Engage the supernatural powers and emerge from the shadows of your castle to experience Astral Projection, Hocus Pocus Scatters and Magic Reels, all leading to the same cause – a static 750-coin jackpot to be scored in this mysterious magic-themed game. In the Normal mode, Magic Wilds is a 5-reel 4-row 32-payline video slot machine quickly turning into an action-packed challenge utilizing the 5-reel 8-row 100-payline layout. Red Rake Gaming’s Magic Wilds slot review will tell you much more about this intriguing title. We have no free play mode available yet, but take a look at the Magic Wilds screenshots instead. Or why not simply giving a try with one of the recommended casino sites above? Before the reels actually start spinning, players have to define will they play for fun or for real money. Those who opt for the Magic Wilds Free Play will receive 1000 demo credits to learn how to win and see what to expect from the paytable. In any case, your task would be to match 3 or more icons and place bets manually or using the Autoplay mode. Another important info which will surely determine your betting strategy is that the coin value ranges from €0.10 to €50, so you can place a single coin per round. Thanks to the Astral Projection feature, the Magician symbol occupied a single reel duplicates a random number of times on the reels turning into Wilds. Speaking of which, their payout rating is significantly higher than the gargoyles’. Lucky winners gathered 3, 4 or 5 Wilds will receive 50, 100 or 750 coins, respectively. When the same number of green, blue or red gargoyles appears on an active payline, you’ll receive between 25 and 250 coins. 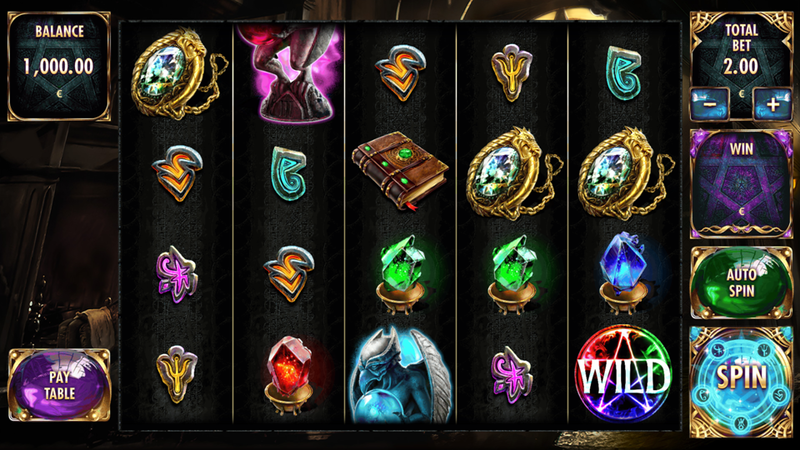 Magic-themed icons pay a bit lower, but there’s nothing wrong in receiving 150 coins for 5 Book of Spells or 75 coins for 5 Gems. The only item that can’t be replaced by Wilds in the Magic Wilds Bonus symbol, much needed to activate 1 out of 2 rewarding features closely elaborated below. Collect 3 Scatters appearing on the reels 1, 3 and 5 to receive 12 Magic Wilds Free Spins. This is surely the most rewarding feature in this game as it brings the Hocus Pocus Scatters and Magic Reels. The first case scenario comes with Scatter +1 symbol on the reel 5 adding an extra spin if appears during this round. On the other side, a randomly-chosen reel may increase the number of rows up to the maximum of 8 to increase your earning potential. We have a full mobile compatibility, meaning there’s no need to download an app for Android and iPhone in order to play online around sites powered by Red Rake Gaming. 3. What is the RTP factor of Magic Wilds? The official info is the RTP stands at 95.30%. Our Magic Wilds tutorial proved the same figure. A powerful magician with abilities off from this world, rewarding bonus rounds and extra spins are just among many things you should definitely take into consideration when making a decision will you try the game or just pass it by. With our Magic Wilds tips, your chances to beat the house are much higher, so think again.